I love documentaries. And when one comes along that is as enthralling and unpredictable as Exit Through The Gift Shop, it only reminds my of just how effective an art medium film can be: especially in the hands of someone as talented as graffiti artist Banksy, and not, as we are initially led to believe, Los Angeles Frenchman Theirry Guetta. The film starts out as a bio of Guetta, a man who is so stereotypically French that one would think that Peter Sellers used him as inspiration. Guetta had become obesessed with the video camera after taping his baby girl. After that, he couldn’t get the camera out of his hand. He taped everything and everyone, whether they wanted him to or not. At one point, visiting his family back in France, he finds out that his cousin has been going around Europe, mounting small, tiled mosaics of Spaced Invaders characters to public features: Street lamps, bridges, doorways, etc. This is graffiti artist Invader. Guetta, as his personality dictates, becomes addicted to this new world. A world where you are going into the dark of night to engage in actions to make statement, to affect society, and which happen to be illegal. Through Invader, Guetta meets Los Angeles graffiti artist Shepard Fairey, best known for creating the iconic Obama poster campaign. Fairey allows Guetta to follow him in the LA nights, plastered stenciled artwork on blank city surfaces, documenting the creation of the art as well as the art itself. Art that will be gone in a matter of days, painted over by a city trying to keep itself clean by covering the brilliant art along with the pointless tags thrown up by talentless teens. Guetta becomes one of the crew, scaling buildings and ladders, traversing high rooftops, just to make sure that he is with the team, experiencing it all. And as Guetta, and we as the audience, are exposed into this underground world, we find Banksy. Banksy is a British-based graffiti artist. But that title doesn’t really encapsulate what he is and it diminishes what he does. He’s an artist with an eye on social commentary whose media of expression changes to suit the message he is conveying, be it placing his own mock art up in National Museum among “The Greats” or mounting an inflatable Guantanamo hooded prisoner around the railed bend of the Rocky Mountain ride at Disneyland. His primary monicker is a stenciled rat, but the methods always change. Banksy is completely elusive and without identity in order to elude persecution. And his anonymity is his fame. Guetta, through his connections with Invader, Fairey, and his growing circle of like-minded artists, finally gets an audience with Banksy, who allows the Frenchman to document his processes, even giving Guetta access to his workshop somewhere near London. Guetta has accumulated thousands and thousands of tapes that simply get stored into boxes, and despite his intention to make a film, it looks like nothing is going to come of it. Realizing the disconnect, Banksy encourages Guetta to cut together the film that is obviously hidden amongst the tapes. Guetta does. Banksy watches it. The film is unwatchable. An assault of imagery. Banksy convinces Guetta to leave the tapes with him, go back to Los Angeles and begin to pursue a life in graffiti art since through observation, he has learned a great deal about both technique, expression and execution. A decision that we find, Banksy will regret. This is where the film makes an abrupt turn, and it becomes a documentary about the documentarian. Theirry Guetta begins to reinvent himself into a new artist persona MBW, or “Mr. Brainwash”… a name as shallow and uncreative as the art he generates. But using his association with Banksy and the others, he has an art opening within a short time span that would dwarf openings that most artists wouldn’t hope for in a lifetime of work. The art is horribly derivative, and it takes Los Angeles art collectors for millions. In researching the background for Exit Through The Gift Shop, I’ve found that there were rumors circulating that the entire film was a hoax perpetrated by Banksy himself, and other rumors that Guetta IS Banksy. 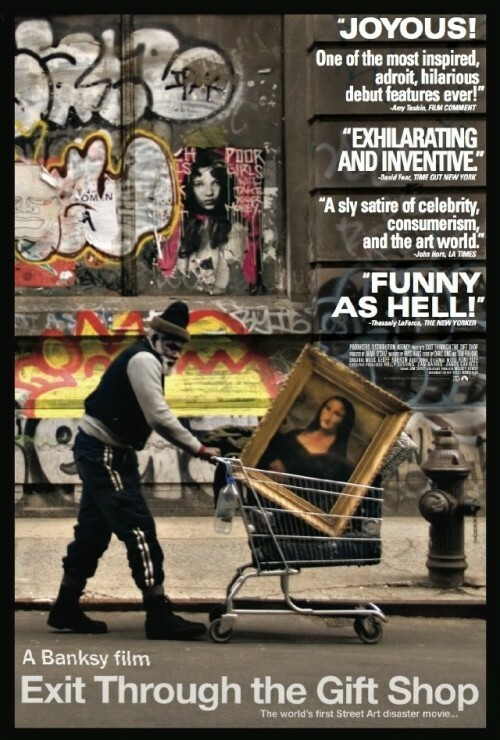 The film is yet another social commentary, pointed at the absurdity and gullibility of the art world. I’ve found no confirmation to prove or disprove these. But the message remains clear: There is a very blurry line between staying true and pure to your art…and selling out. What is also obvious is that Bansky is as talented a filmmaker as he is with any other medium he puts his hands on. The film is brilliantly structured with an amazing sense of balance between good humor, serious commentary and utter tragedy in the form of Theirry Guetta, who started out as a wide-eyed observer of the world, filled with wonder and excitement who ends up a tyrannical plagiarist with millions of dollars and absolutely no respect.